With historic record of more than five thousand participants, it runs today the 29th edition of Marabana 2015. 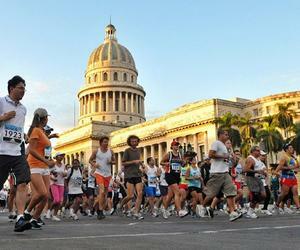 Nearly 600 Americans are running this marathon, the first to be organized on the island after the diplomatic thaw between the governments of Cuba and Washington, organizers reported. Until last Saturday, "567 runners from that northern nation were officially registered, a record figure for these events," according to the president of the organizing committee of the Marathon of Havana, Carlos Gattorno. As had been previously announced, in the marathon are present, among US athletes or clubs who have traveled the country, Floyd Mayweather, considered one of the best professional boxers in history; NBA star Carmelo Anthony, and the New York Cosmos club.